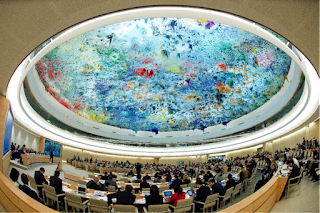 A general view during the 30th regular Session at the Human Rights Council. 21 September 2015. Christine Chung is a Senior Advisor to the Committee for Human Rights in North Korea and the former Political Advisor to the Commission of Inquiry on Human Rights in the Democratic People's Republic of Korea. As a human rights officer for the Office of the United Nations High Commissioner for Human Rights, she managed the Office's technical cooperation program with China, supported the Special Rapporteur on the situation of human rights in Myanmar, and served desk functions for Northeast and Southeast Asia. She is currently serving as the political analyst for the OSCE/ODIHR Election Observation Mission to the Kyrgyz Republic Parliamentary Elections. On Monday, September 21st in Geneva, the United Nations Human Rights Council elevated discussion of North Korea’s human rights situation from the side events that have regularly taken place in the halls of the Palais des Nations to the main chamber with its first official panel discussion. Although both the Human Rights Council and the General Assembly’s Third Committee have regularly hosted reporting by and interactive dialogues with the Special Rapporteur on the situation of human rights in the Democratic People’s Republic of Korea (DPRK) for many years, the panel featured civil society representatives alongside Marzuki Darusman, the current mandate-holder. The panel is part of the continuing legacy of the work of the Commission of Inquiry on Human Rights in the DPRK (COI), whose comprehensive report in February 2014 captured the attention of the international community with its assessment that the scale and scope of North Korea’s human rights violations amount to crimes against humanity. Although the focus of the panel discussion was on “international abductions, enforced disappearances and related matters,” such a broad heading allowed panelists and speakers to touch on many ongoing concerns from political prison camp populations to summary executions for watching South Korean soap operas. The main question posed to the panel was raised early in the list of speakers by the representative from Albania: what further strategies are available to address the dire human rights situation in North Korea? It was repeated by various speakers thereafter. This article will address the responses of the panel, provide a summary of highlights of the discussion, and assess possible directions for the international community. The format of the three-hour panel was to start with introductory remarks by former Chair of the COI Michael Kirby who, as the moderator, asked the panelists to make brief presentations to be followed by an interactive discussion broken into two 45 minute segments of comments and questions from the floor with 15 minutes of response by panelists. The panel was comprised of Special Rapporteur Darusman, ”Hidden Gulag” author David Hawk, Kwon Eun-Kyoung, representing the International Coalition to Stop Crimes against Humanity in North Korea, and Koichiro Iizuka, Vice Secretary-General, Association of Families of Victims Kidnapped by North Korea. 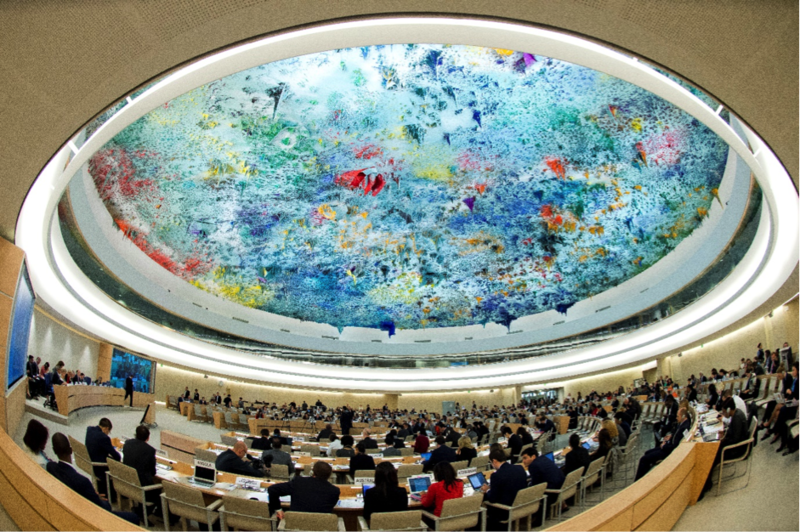 The interactive dialogue followed Human Rights Council procedure with a registration of a list of speakers each with two minutes speaking time enforced by the Human Rights Council President H.E. Joachim Ruecker who chaired the panel. Mr. Ruecker made one real point aside from the need for speakers to adhere to the time limit: house rules also require speakers to use the official name of the country in question. The Honorable Michael Kirby reminded the Council of the timeline of the COI and that its report had been delivered on time, on budget, and unanimously. He explained that the topics that had been singled out for the panel included a very large number of people who had been abducted and disappeared and their loved ones, even though more people would have been affected by violations of the right to food; nevertheless, these were powerful human stories of suffering and could not be ignored. The Special Rapporteur noted that there has been a new turn in the relations between North and South Korea with the next round of family reunions expected at the end of October. He appealed to both sides to amplify the number of families involved in the reunions with some 66,000 families needing to be reunified but only 100, drawn by lottery, able to participate. Mr. Kirby calculated that it would require some 660 years for all the families to be reunited at that rate. David Hawk turned his attention to the brutal deprivation of liberty of North Koreans who are subject to incognito detention in their own country. He stressed the need to ask for an accounting of these North Koreans who are forcibly disappeared into the kwan-li-so, translated as “managed places,” but are more widely known as political prison camps whose existence the North Korean authorities continue to deny, most recently at the country’s second Universal Periodic Review (UPR) in April 2014. Koichiro Iizuka spoke of the agony of having his young single mother taken from his 3-year-old sister and him and then being told during the Japan-North Korea summit meeting in 2002 that North Korean authorities acknowledged abducting her but that she had subsequently died in a traffic accident. Eun-kyoung Kwon provided an update on frequent summary executions of people who were caught watching foreign programs on video, listening to South Korean radio broadcasts, or possessing illegal cell phones. The list of speakers moved from Japan—whose representative noted that there can be no normalization of relations until North Korea addresses its human rights situation and allows families of abductees to reunite—to the European Union (EU). The EU representative called for the closing of all political prison camps, reiterated support for the COI’s recommendations, including the referral of North Korea to the International Criminal Court (ICC), and welcomed the Office of the High Commissioner for Human Rights (OHCHR) field-based mechanism in Seoul. Most EU Member States aligned themselves with the EU’s statement, including Ireland, Germany, Latvia, and the Czech Republic in the first segment, then Poland, the Netherlands, Austria, Estonia, Slovenia, Slovakia, and Belgium in the second segment. Albania commended the panel but was followed by Cuba whose representative opposed selective and political mandates including the Special Rapporteur on North Korea and the COI. The representative stated that “dialogue” was preferable to “confrontation,” citing UPR as an ideal forum for cooperation on human rights. The emphasis on UPR as a viable alternative to country specific mandates was also raised by Myanmar, Laos, Venezuela, and Russia, while Belarus, Syria, and Iran called more generally for non-interference and cooperation. France also called for ICC referral and the need to end detentions. The United States recalled that 80,000 to 120,000 people, including children, are still languishing in political prison camps. Norway welcomed efforts to establish a contact group as recommended by the COI. Liechtenstein noted that one and a half years have passed since the findings of the COI were released and the Security Council referral of North Korea to the ICC had yet to materialize, so perhaps more urgency was required and universal jurisdiction might be considered. China’s representative said that peace is a necessary pre-condition on the peninsula. She noted that, as we observe the 10th anniversary of the joint statement from the Six Party Talks, the responsible position on Northeast Asia should involve the re-launching of denuclearization talks. Towards the end of each interactive segment, NGOs were given the floor. Speaking for UN Watch was Yeon-mi Park, a 21-year-old woman from North Korea who eight years earlier had escaped across the river to China only to see her mother raped and sold while she herself was sold for $260 as a 13-year-old child bride. She recounted crossing the Gobi Desert under difficult conditions to Mongolia to escape trafficking in China. She objected to being called a puppet by the North Korean government and noted that her relatives were still suffering in North Korea. Human Rights Watch (HRW) made the first explicit reference to China immediately after Ms. Park’s personal story reminding the Human Rights Council that these violations have a China dimension with its government labeling all North Korean refugees as illegal economic migrants and subjecting them to repatriation. This makes China complicit in the crimes that take place in North Korea. HRW’s representative emphasized the need for collective action. After the first segment of the interactive dialogue, Mr. Kirby responded to the North Korean representative’s charges that the COI was subject to the bidding of the United States. Given his history as a judge in Australia and the pledge of independence that he and the other commissioners took at the start of their work, he rejected the allegation of having political motivations. Noting that North Korea’s representative had made no reference to the particular issue of abductions and disappearances, he hoped that the lapse indicated North Korea’s continuing support for family reunions. Mr. Kirby characterized the problem as essentially one of mechanism rather than principle, which perhaps new technologies such as Skype and email, but also old-fashioned letters, could help to resolve. He also responded to the recitation of the North Korean proverb; since the signing of the UN Charter in 1945, universal human rights is not the business of one regime but a common issue for the international community. The panelists provided a range of practical measures. The exception was Mr. Iizuka, who responded that as a member of the public rather than a representative of the Japanese government he was not in a position to make an official recommendation. However, as a 38-year-old Japanese citizen whose mother had been taken away by North Koreans when he was only a 1-year-old child— before he could form his own memories of her—he hoped that he could be reunited with her before it is too late. The Special Rapporteur called for a concerted intellectual effort by the international community to put in place an accountability mechanism. Mr. Hawk took exception with the North Korean claim of an international community conspiracy against their socialist system. The international concern, he explained, is about a particular phenomenon of repression. Some people believe that the progressive dismantling of Camp No. 18, which involved a broad clearance with release of prisoners in place, might also work for Camps No. 14, No. 16, and No. 25. Ms. Kwon noted that the North Korean authorities criticize the testimony of some North Korean escapees, but hundreds of cases have been filed with the Working Group on Arbitrary Detention and the Working Group on Enforced or Involuntary Disappearances. While the North Korean authorities refuse to provide information on these cases, they have the capacity to do so. The second segment of the interactive dialogue saw general support for the COI recommendations, including the OHCHR field office in Seoul by New Zealand, Costa Rica, Australia, Lithuania, the United Kingdom, Portugal, Spain, Canada, and the aforementioned EU states. The representative of the Republic of Korea noted that 130,000 families had been separated during the war and in its aftermath; after almost seven decades, half of them are no longer alive. He clarified that the two Koreas had agreed to family reunifications for 200 families and hoped for more regular events on a larger scale. Two NGOs spoke during the second segment: Conscience and Peace Tax International and the World Evangelical Alliance. The former called on the Human Rights Council to convene a peaceful settlement conference as stipulated in the armistice agreement 62 years ago. The World Evangelical Alliance noted UN reports on food insecurity and stunting of children that call for monitoring of distribution. North Korea’s four churches in Pyongyang are severely constrained, and North Koreans are punished for possessing bibles. The same organization pleaded that China should reconsider its practice of refoulement of fleeing North Koreans. In their final comments, the panel members provided some key points for considering future strategies on North Korean human rights. The Special Rapporteur announced that in the coming days there would be more information forthcoming about the follow-up on the COI’s recommendation to establish a contact group as well as the group’s composition and other details. According to Mr. Darusman, this contact group would be able to address the problem that no action is taken on North Korean human rights between sessions of the Human Rights Council. On the question of what OHCHR’s field-based mechanism could accomplish, he alluded to the need to re-establish exact figures of Japanese and South Korean abductees following new findings which needed corroboration. David Hawk explained that the usual avenues to address human rights are not available in North Korea as there is no civil society, independent press, indigenous human rights defenders, or ability of people to regularly communicate by phone with those outside North Korea; this leaves only expressions of concern by the international community as an available mechanism. He recommended continuing to press Pyongyang for dialogue with the Special Rapporteur and the High Commissioner—with the contact group as a significant potential breakthrough—urging UN Member States whose recommendations to North Korea during the UPR had been accepted or noted to follow up with the government, and making efforts to keep North Korean human rights in the spotlight. Koichiro Iizuka mentioned the difficulties of dialogue with North Korea given its ultimately insincere attitude. Michael Kirby closed the panel by suggesting the possibility of separating the issues of abductees and disappeared persons and moving that to a more technical level of discussion. In this respect, forming an aggregate list of families who wish to find family members, as has often been done at the end of wars, might be an interesting step. He reminded the Council of the COI’s recommendation for more people-to-people contacts, possibly involving professionals such as dentists or lawyers. The panel appears to have provided another channel for bringing attention to the plight of various groups suffering from the ongoing violations of human rights in North Korea. Discomforting scrutiny is one of the few identifiable tools available to the international community for provoking any response from the North Korean authorities on human rights concerns. Likewise, reminders about the need for accountability appear to continue to resonate at the highest level in Pyongyang. The High Commissioner alluded in his oral update on the field-based mechanism in Seoul, which followed the panel discussion, to the potentially constructive role that the Seoul office could play beyond continuing its documentation and advocacy work. He further said that office staff are broadening contact with civil society in the region, as there are regional implications of the human rights situation in North Korea. It falls within the office’s mandate to strengthen monitoring and documentation, maintain visibility of the issue, and enhance engagement and capacity building of governments of all states concerned, civil society, and other stakeholders. Nevertheless, this point highlights what was left unsaid by panelists and diplomats in the Human Rights Council this week: that China remains a key link to any resolution of the situation of gross and systematic human rights violations in North Korea. Only civil society representatives raised the problem of refoulement by China and China’s complicity in the crimes that are committed against those North Koreans who are severely punished for attempting to escape the country. In fact, China’s role in enabling North Korea’s draconian control over its population goes beyond its own failure to respect international human rights and refugee conventions and is the subject for a longer discussion. The COI broke new ground when it named China in its report rather than referring to it as a neighboring state as had been the practice within the United Nations. As numerous speakers and the panelists themselves highlighted the urgency of addressing the human rights situation in North Korea, the international community needs to regard the regional dimensions of not only the problem but also the solution. Having spoken at a UN meeting headed by Michael Kirby a few years, it appears that abuse of human rights in North Korea is still a current issue of gigantic proportion. Perhaps, the UN needs to take stronger action with tighter restrictions and sanctions.